Flux Core Arc Welding (FCAW) is actually a catch-all name for two types of flux cored welding processes known as “self shielded”, which is operated without an external shielding gas, and “dual shield, which operates with an external shielded gas. In both processes a hollow electrode wire is fed through a weld gun to fill the weld joint. The “self-shielding” process utilizes a hollow wire electrode filled with a flux compound. The flux compound heated by the welding arc forms an internal gas that protects the weld from gases in the atmosphere. When FCAW is paired with an external shielding gas, it forms a dual shield because it uses an external shielding gas and an electrode wire filled with flux to create a stronger weld with fewer weld defects than other welding processes. Flux Core Welding (FCAW) is often considered the strongest and most effective welding process because it makes metals melt at different temperatures due to the flux used in the process. When heat reaches the flux, it melts and produces a gas that pushes the atmospheric gas back out before oxidation can occur. The flux helps insulate the weld so it requires less cooling time. By Gregory Sanders: This article has been updated to reflect the most accurate information regarding flux core welder available for those who are interested in flux welding. The best 5 available have changed, and information has been added to assist individuals in finding the best flux core welding machines currently available on the market. The FAQ has also been updated. Let's take a look at the strengths and weaknesses of some of the best flux-core welders. The best features of the Goplus MIG 130 welder are its size, its price and its ability to be used for MIG welding and flux core welding. With a remarkably low price and weighing roughly 35 pounds, the Goplus is one of the lightest and least expensive machines. Its relatively small size allows for convenient storage and portability. The first thing we found to be wanting is the power output. The welder has a maximum power output of 110V, which is not that great if you want to do some serious welding. The fact that the welder can’t produce that much power means that you won’t be able to fuse thicker metal, like steel plates, well. However, sheet steel is still within the range of this welder, and it will do a great job welding it. Another major concern is the hammer/brush combo that comes with the Goplus 130 MIG welder. These pieces are not very sturdy, as they are made of inexpensive materials. They may not last long and you might need to replace them. We must say that the warranty Goplus Corp offers is not very extensive. They offer a 6 months warranty. Of course, for such an inexpensive machine, it is not very surprising. Even so, the manufacturer offers to replace a unit if you send it back within 30 days of purchase. In addition, Goplus Corp ensures you that their products are always in pristine condition when they are delivered and urge you to contact them if there are any problems with the unit upon arrival. All in all, the Goplus MIG 130 is a superb machine, and you will be a very proud owner if you decide to go ahead and buy it. This is a value welder, perfect for small-time welding jobs. It is not powerful, but its lightweight and narrow specialization make it desirable for hobbyists and welding enthusiast around the world. This unit can be used for both MIG welding and Flux Cored Welding and can weld steel alloys ranging from 24ga up to ¼ inch. The fact that it can be moved around with ease is quite beneficial to the user and allows for easier storage. On top of that, the machine doesn’t feel cheap, and its slight heftiness is a testimony to its quality. Another great pro for this machine is that it is a simple plug and play so it is very easy to use. 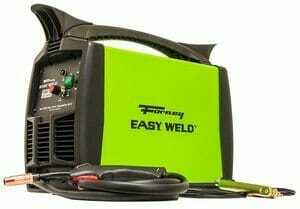 The Forney 299 is a small-job welder. You will be just fine welding smaller pieces of metal, but when heavy-duty fixes or projects need welding, you will have to pull out a heavier unit. However, for all those looking for a small machine that will enable quick welding, this is just the thing. The warranty for the most part is 5 years. There is also a 3-year warranty on the parts that are not the transformer, and there is a 1-year for all components and parts outside the battery charger and welder cover. The last part is 90 days if the machine is being used for industrial purposes. This welder is an excellent choice for those looking for a smaller, more specialized welder. The welder is not for finer welds, and not for big jobs. But for hobby welding or to fix a few things around the house or on your car, Forney Easy Weld 299 is just the welder for you. It is rare to find a multi-purpose welding machine in the starter category but the Super Deal has the ability to handle both MIG welding and Flux Core Welding. Wire welding machines are not really considered that powerful; however, the Super Deal Black Commercial MIG 130AC Flux Core Wire Automatic Feed Welding machine runs on 110V/60Hz single-phase voltage and has a duty cycle of 10% at 105 AMP and 35% at 60 AMP. This Welding machine is a nice lightweight portable machine at 36.8 pounds with a sturdy handle on the top, which makes transportation easy. This welding machine is attractively priced. This machine does come equipped with a welding mask, but the mask is not very durable. Some people have found it a little difficult to see through. Don’t rely on the wire that comes with the machine, as it does not always work that well with the automatic feed mechanism of the machine because it is too thin. You are better off buying the MIG wire separately to use with the machine. Unfortunately, the documentation and instructions on how to use the machine are not much help as they lack detail. Fortunately, the welding machine is pretty easy to use and you can watch some YouTube videos online to figure out how to load the wire and use it. SuperDealUsa is based in CA, United States. They are one of the TOP 100 sellers on Amazon USA. They are not a manufacturer but rather a wholesaler. Any issue that might arise with regard to your product will be honored directly by SuperDealUSA. 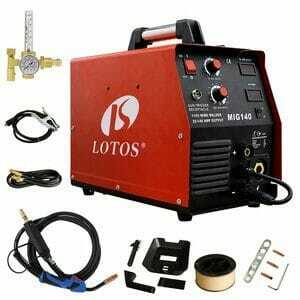 Overall, for this price you are not likely to find a better wire welding machine for small projects. It has more power than you would expect from a light-duty welder and it is capable of welding thin aluminum or sheet metal from 16 gauge to 3/8” thick. Although the documentation and instructions are a little lacking, this welding machine is fairly easy to use. This wire welding machine is fairly powerful and can produce industrial-quality welds. However it runs on 110V/60Hz single phase voltage and has a duty cycle of 10% at 105 AMP and 35% at 60 AMP. The 2T/4T switch and 2 displayers on the digital wire speed display give you complete control over your speed and voltage. This machine can work with a variety of metals including stainless steel and mild steel up to 18 gauge as well as aluminum up to 1/8”. The first thing we found to be wanting is the power output. The welder has a maximum power output of 110V, which is not that great if you want to do some serious welding. The fact that the welder can’t produce that much power means that thicker metal like steel plate won’t be able to fuse as well. However, it will do a great job welding sheet steel. Feeding new wire through can be a little difficult so you’ll need a steady hand. If you plan to mount this welding machine on a cart, take care because the gas hose connection can interfere with the tank. This unit does not come with a spool gun, so if you plan to weld aluminum, you’ll need to purchase that separately. The machine comes with a 30-Day warrantee that promises you 100% satisfaction or your money back. This gives you a chance to use the machine and see how you like it before committing to long-term use. The Lotos MIG 140 welding machine is perfectly suited for hobbyists and people looking to do some light duty welding as it sets up quickly and is very versatile. The Arksen is a versatile welding machine as it can be used for MIG welding and Flux Core Welding as well as aluminum gas welding. In addition, the operator can choose from several amperages up to 140 amps. The positives don’t end there as this little welder can handle welding steel, stainless steel and aluminum up to 3/8” inch thick. This unit has a nice little duty cycle at 35% at 60A and 10% at 105A and it doesn’t require any special power requirements as it operates on 115V household input. This is a nice little welding machine but the operators manual does not provide much instruction making it difficult to know how to adjust the settings for heat and wire feeding properly for different thicknesses of metals or different types of metal. Despite the lack of detailed instruction, the machine is fairly easy to use. Some operators have had some difficulty with the wire feed wheel occasionally not turning. This welding machine is great for hobbyists and home use but not really meant for heavy-duty project work. Flux Core Arc Welding can be used with a variety of metal alloys including mild and low alloy steels, stainless steel, high nickel alloys and some surfacing alloys. The dual-shield FCAW process can produce more welds at a higher rate because the operator does not have to stop to change out electrodes. This process is often used in high-speed applications such as automotive assembly. FCAW can also be used without an external shielding gas, as it is “self-shielding”. This type of FCAW is particularly useful in outdoor and agricultural applications or windy conditions, in out-of-position welding and when welding materials thicker than 16 ga.
What’s Alike and What’s Different From MIG? Flux Cored Arc Welding, also known as FCAW, is a process similar to gas metal arc welding (GMAW, also known as MIG welding). Both process result in a metal arc forming between a wire electrode and the metal to be welded, which cause them to melt and join together. Unlike GMAW or MIG Welding, FCAW can be used either with or without a shielding gas. Arksen warranties its machines for up to three years. Accurate and timely information is available through authorized dealers. For a relatively inexpensive welding machine, the Arksen MIG-130 works pretty well. 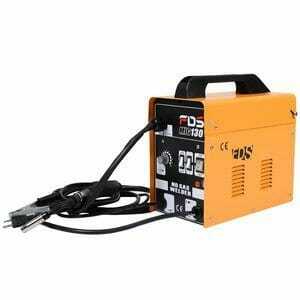 It is fairly powerful for a light-duty welder and can handle thick metals of differing types. Although the Operator’s manual is lacking, the machine itself is fairly easy to use. In order to achieve the best possible welding results, the operator should have the knowledge of how and when to use a self-shielded flux cored wire and a gas shielded flux cored wire as well as how to operate a FCAW weld gun. As with any welding process, the proper equipment and safety gear is essential to the success of your project. Any of the FCAW machines reviewed herein would get the job done so it really depends on your price threshold and the features you consider essential.